Session 2: The Land Grant Process of NC/TN — Speaker J. Mark Lowe is a great speaker and this enlightening session will help me with my East Tennessee research. Spooky light activity in the room was blamed on a ghost that follows Mark around. Lunch: Tomato Head with 8 of some of my closest genea-peeps and a couple of their hubbies. Yummy food and good conversation. Session 4: College & University Records: good overview of what’s out there but I was hoping for more tips on where to find these gems. Session 5: Not allowed to blog about this one, but it wasn’t my favorite session, so that’s probably for the best. Other highlights: Greta Koehl gave me the copy of Who Do You Think You Are by Megan Smolenyak Smolenyak that she won yesterday — thanks, Greta! Also bought a huge tome on North Carolina research that was recommended as a good overall research guide. Can’t wait to dig into both of these books. My grandma’s taco meat is warming up in in the Crock Pot and the sangria is chilling. Glad that some of my fellow FGS attendees can make it tonight! Just finished putting the ingredients for my grandma’s taco meat into the Crock Pot for a shindig my sister and I are throwing tomorrow night with my genea-friends and her pals from the area. Should be a good time. Now, I have to admit I was dubious about the second session as I walked into the room and saw a transparency projected onto the screen. More alarm bells went off when I noticed the speaker adjusting said transparency was in period costume. But I was in for a treat because the speaker was the legendary George Schweitzer and he was a hoot. In addition to being a funny, engaging speaker, he also really knew his stuff. Before this session, I got to chatting with one of my neighbors and learned she lives not to far from me in Virginia. When I found out she was a scrapbooker and Creative Memories fan, I told her about an upcoming 11-hour crop near her neck of the woods in October (see my write-up from last year’s event). She was excited to hear about it and I hope she’ll join me there! Next, I attended “‘I’ll Fly Away’: Using Southern Church Records in Genealogical Research.” I came away with a lot of resources to check out regarding the Methodist preachers on my father’s side of the family and also for finding records of interest from many other denominations. Unbeknownst to me, I had registered (or otherwise obtained a ticket) for the luncheon of the International Society of Family History Writers and Editors. I’m glad I happened to have the ticket because I really enjoyed the luncheon and made some good connections. One of my table-mates works in Illinois and gave me some good tips for researching my Corley roots there. After lunch, I ran into Amy Coffin, who informed me that I’d won a door prize at the APG table. I had just enough time to pick up my prize before my next session. I received a copy of Courthouse Research for Family Historians. I was thrilled because I’ve had this book on my wishlist for a while. Funnily enough, the next session I was to attend was “The Courthouse Burned: Alternate Approaches and Treasures.” This was a thorough session on what to try if you’re researching ancestors from a county (primarily in the South) whose courthouse burned either during the Civil War or in another conflagration or had other calamities that resulted in record destruction. The final session I attended was “Irish Emigration to North America: Before, During and After the Famine.” This was a very informative session that helped me to figure out what was going on when my great-grandfather came over from Ireland (not necessarily the famine, as I thought initially). Speaker Paul Milner gave clues as to where Irish immigrants came from in Ireland at various points throughout history. I feel a bit more confident in researching this line now that I’m armed with this information. But the day wasn’t over yet! Prize drawings were coming up at the exhibit hall and I wanted to take another look around because I felt like there were a few more nooks to explore after my survey of the exhibits yesterday. I perused a few more book stores and bought some supplies at the Fun Stuff for Genealogists booth before I sat down near the snack bar to wait with a tableful of my genea-peeps until the door prizes were announced. Tina Lyons and I had by this time both won door prizes earlier in the day and sadly no one else at the table won, but we had a great time joking with each other and making fun of the odd way they were announcing the prizes. By that time, I had scored yet another free day of parking (woohoo!) and needed to head to the grocery store to buy the provisions for the aforesaid taco meat. It has been a full week, but I’m kinda sad that the conference ends tomorrow. Just back from an even fuller (more full?) day at the FGS conference. Started bright and early at the FamilySearch.org Blogger’s Breakfast where they debuted some upcoming features (new catalog search functionality and ancestor pages) and then asked me and about 14 other bloggers for opinions on various FamilySearch.org initiatives. The session was well worth the early start time — thanks to FamilySearch for the invite and the free swag (a NGS DVD, USB hub, brochures, and a lovely breakfast). The official opening session of the conference was a riot. Mark Lowe and Kent Wentworth traded jibes, jokes and stories in a fun Tennessee v. Kentucky match-up. They also shared some ideas for doing research in both states. The exhibit halls opened after the session and I think I did pretty well, only spending $20 on items when there was so much there for the taking/buying. For those curious, I bought RootsMagic4 and the guidebook as a package deal after chatting with the helpful staff at their table. I then attended a session on tracing immigrant ancestors to their countries of origin. This session was packed full of strategies and resources to try. It gave me hope for the searches I have ahead of me for my British, Scottish and German ancestors. After lunch with Amy Coffin, Tonia Hendricks, Tina Lyons and her husband, I headed to a two-hour session by Elizabeth Shown Mills on Southern Research Strategies, especially for tracing the stories of poor, black and female ancestors. She presented two case studies that were complex and fascinating. She used a bullseye strategy, beginning with the ancestor at their earliest known/proved place of residence, slowly working out in concentric circles by studying their family, neighbors and acquaintances to search for evidence. After that, I reunited with Amy and Tonia and a couple of other GeneaBloggers for the Genealogy Guys Podcast taping. They took questions from the audience and provided strategies for busting through brickwalls or approaching new areas. It was a really fun session and I think could be a model for future activities — with or without the podcast aspect. After the podcast, Amy and I headed out to Market Square (the skies had cleared!) and talked shop over yummy food. Then I departed for the East Tennessee Family History Center, which has been kind enough to extend their hours this week while we’re in town. I have family from Carter County in East Tennessee. After talking with the ETFH folks at the exhibit hall this morning, I wanted to check out the indexes for two of their journals to see if any of my surnames were covered. When I arrived after dinner, a staff member at the reference desk mentioned that they also had compiled genealogies. I made a beeline for that room and requested the vertical files they had on the HAYES surname and paged through a Carter County scrapbook while I waited for the records to be pulled. Most of the staff I encountered were nice, but one curmudgeonly guy was obviously put out by my newbie visitor questions. Harumph right back to him. I didn’t find any real answers on this visit because I was pressed for time before they closed, but I noted the other vertical files they have available for a future visit. I also began searching through the indexes of the East Tennessee publications in their holdings. I’m looking forward to my next visit to the area so I can follow-up on what I saw today (and may even try to play hooky from a session or two tomorrow or Saturday to do more research). 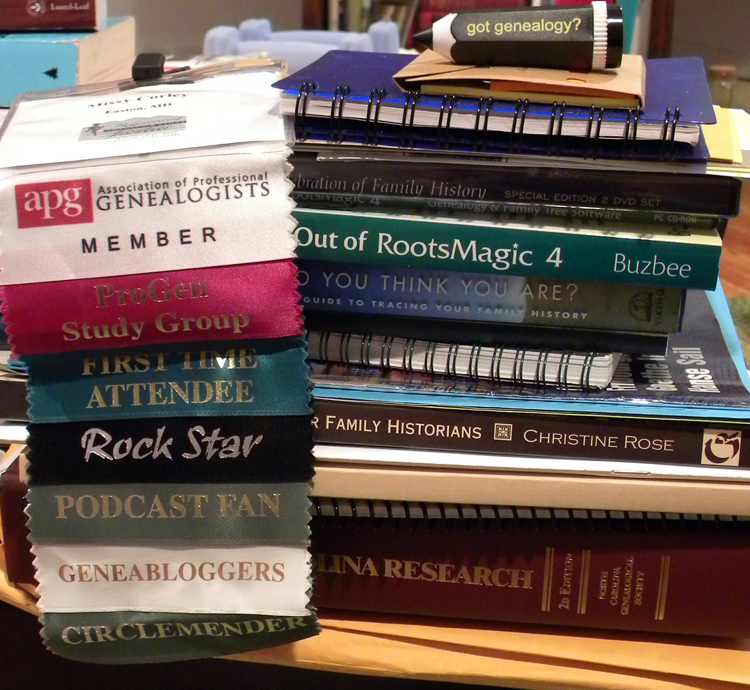 Just returned to my sister’s house after a very full Day 1 at the Federation of Genealogical Societies conference. After sleeping in and a quick breakfast, I met up with Amy Coffin to pick up our registration packets. While we were at the Knoxville Convention Center, we moseyed around the World’s Fair Park, including the Sunsphere and amphitheater. Then we walked down to Market Square for lunch at Soccer Taco (so good!). After lunch, we checked out the concierge suite at the Hilton before I headed back to the convention center to attend a couple of sessions about FamilySearch.org. The first session dealt with an initiative called “Project X,” which seeks to concentrate resources including information, training and access to people and organizations through tools like wiki.familysearch.org, forums.familysearch.org and online training classes available on the main site. I was really surprised by some of the resources that I didn’t know were available at the resources above. For instance, the wiki includes sections on items like English probate jurisdiction and elaborate census index site matrices. The wiki is now up to 40,000 pages and grows at a rate of 1,200 pages a month — impressive! The second session I attended drilled down deep into the forums at FamilySearch.org. Did you know there are social groups there based on topics like common ancestors, FHC locations, indexing and more? The folks at FamilySearch are building the forums up to be robust enough to guarantee responses to research questions. That’s fantastic! After these sessions, I met up again with Amy, Thomas MacEntee, Tina Lyons and Tonia Kendrick for drinks before joining 17 other fellow ProGen participants for dinner at Trio at Market Square. I had a great conversation three others in the study group who are in various stages of the program. We all compared notes on our various research projects — I got some great ideas to follow up on! I’m happy to report that I heard no admonitions about using Twitter today! In fact, kudos to speaker Michael Ritchey of FamilySearch.org for pointing out how many genealogists are making use of Twitter for their research.